Send text sms links in messages – it sounds so easy and nowadays everybody with a mobile handset or smartphone can do it. Using a smartphone might be suitable for a small client wanting to send SMS to 5 or 10 customers. I have 10,000 customers how do I send text SMS links to them? No worries, we have a solution for you. Sending 5-10 SMS using a smartphone is totally doable. It is, however, another story when companies have a large database of subscribers. 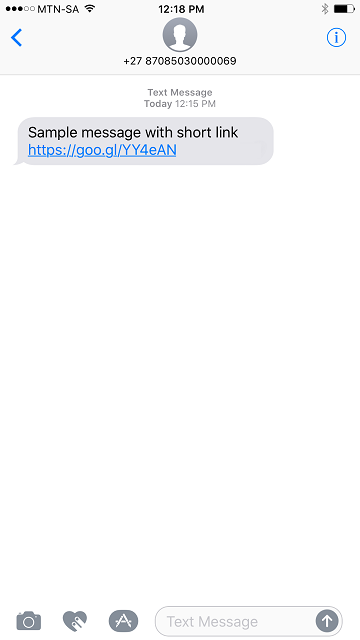 (Anything from 10,000 to 100,000 numbers a day – never forget to have an opt-out in the message as it is a requirement in most countries now). How do I send text SMS links? We can only speak about our own text SMS platform. In this week’s article we will just give an overview of each method, followed by detailed instructions in some follow-up articles. 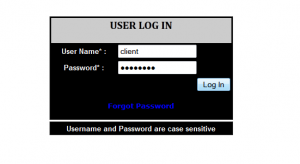 Web panel is a pre-configured website where a customer logs into an account to send SMS. We offer a basic web interface which users may use to send text SMS with links using a file upload. It is the easiest way to send text SMS links. The system is already set up and tested, therefore, the client does not require a tech team or developer to build a system. The user simply compiles a notepad file with all the numbers. The numbers have to be in proper GSM format. Once we establish your needs, we provide a test account. This is the phase where the clients normally decide whether they prefer the HTTP API protocol or to use the web panel. Files may not exceed twenty thousand numbers. (20,000 or 20K). We also test the routes to ensure that links in text are supported by the network operators in the target destination as not all routes support links. Following testing, client purchase credit. We load the account with credit. Client logs in at web url. Upload a file with numbers. Type the message with the links in the designated field. Our web panel allows clients to check the reports – reports are subject to route support. An SMS HTTP API provides the information required to enable web developers to send text SMS from a website. 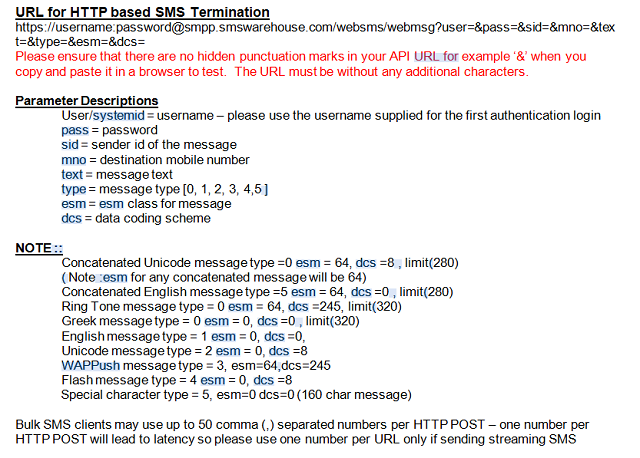 SMS HTTP API’s use straightforward parameters in URL’s to send text SMS messages. TTP API normally works with scripting languages such as PHP and normal web forms which clients complete to send the text SMS messages. Examples of scripting languages are: VB.net, Python, Perl and of course PHP. Coding and development experience is required for this option, therefore, clients are required to either have in-house tech or hire a developer to set up the system. Our EMS server allows web developers to set up text SMS services via the web. Contact us below to set up a test account and provide the required HTTP API. Customers with SMPP servers are normally re-sellers using the routes we have available to deliver text SMS to their clients. E-SPECTATIONS CONSULTING (previously SMSwarehouse) supplies customers with routes since 2004. Routes on offer varies from Economy, Routing team managed routes, Tier 1 and on-net connections. Our Enterprise Messaging Service supports the SMPP protocol. Please contact us to arrange testing of routes. We will quote pricing as it depends on volume, type of messages, quality of route, delivery receipts.